From soup kitchens to impoverished or expectant mothers, to people in danger of homelessness, to job training, to numerous social justice causes and Catholic Charities, to pro-life issues, to Catholic education, the seminary and more, the Annual Catholic Appeal supports the Catholic Church’s many ministries in the Archdiocese of St. Louis. This year, the ACA raised almost $15.5 million from pledges and gifts for the immediate needs of those ministries. Including estate gifts and anticipated matching gifts, the total exceeds $16 million. The parish appeal topped its goal of $14.2 million by more than $400,000 with $14.6 million in pledges. Likewise, ACA executive director Brian Niebrugge praised the faithful’s commitment to the Church’s charitable works. Contributions came from all corners of the archdiocese. According to ACA figures, 137 parishes exceeded fund-raising goals, including 100 that exceeded challenge goals. In addition, 108 parishes achieved their goals for new donors and 68 parishes improved participation. “This is well-run; it’s pretty impressive,” he said, noting that planning for future Appeals already has begun. Though the ACA runs every year in late spring and summer, it’s actually a year-round effort. Since September of 2017, Heeger, a parishioner at St. Gerard Majella in Kirkwood, oversaw the ACA Council of 24 members, which is composed of Archbishop Carlson, Auxiliary Bishop Mark S. Rivituso, Bishop Emeritus Robert J. Hermann, Vicar General Msgr. 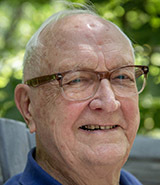 Dennis R. Stehle, clergy and laity. Gus Lewis is involved in stewardship with his parish, Sts. Teresa and Bridget, where he is an integral part of the parish community. He talked with parishioners after Mass on Sept. 9. Gus Lewis returned to his childhood parish, Sts. Teresa and Bridget, in 2007 after not being part of a parish for a while. The people he met “were so friendly, and they welcomed me back into the parish,” Lewis recalled. 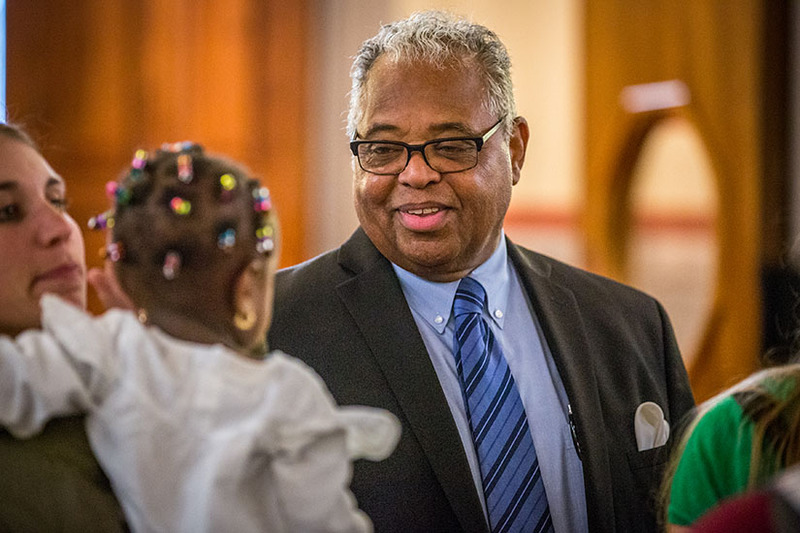 Soon after he began attending Mass at the church in north St. Louis again, parishioners invited him to be a part of the ministries of the parish. He told them he wanted to wait. “I was reluctant. I didn’t think I had anything to offer,” he said. He started praying, asking the Holy Spirit to guide him. That led to a volunteer role as a lector, then the liturgy committee, Angel Dusters (cleaning the interior of the church), Jonah prayer chain and more. “My life has changed. I’m so much happier now. I really enjoy working with the Church and the people,” Lewis said. Lewis and his sister-in-law, Thelma Lewis, were co-chairs of the Annual Catholic Appeal this year at the parish. St. Teresa and Bridget’s goal was $7,260, and parishioners pledged $9,592. The parishioners are generous “when they are asked to step up to the plate,” he said, adding that they also were generous during the Beyond Sunday campaign. Sts. Teresa and Bridget has 300 registered parish households and a wide variety of ministries such as being part of the Winter Outreach program for people who are homeless during extreme temperatures and threatening weather. It also has a youth ministry, adult Gospel choir, Sunday religion classes for children and much more. The parish works in partnership with more than a half-dozen community organizations. There’s a need for funds to be used throughout the archdiocese, Gus Lewis tells parishioners. Funds from the appeal, for example, support the lay formation program that he attends. Some funds also return to Sts. Teresa and Bridget for outstanding needs, he reminds parishioners. The Annual Catholic Appeal funds have helped in maintaining the church, she noted. The parish has received parish viability grants and parish emergency fund grants from the appeal. For example, emergency grants were used to assist with unanticipated costs in removing a steam pipe during construction of a ramp for people with disabilities and for the replacement of an air-conditioning unit. 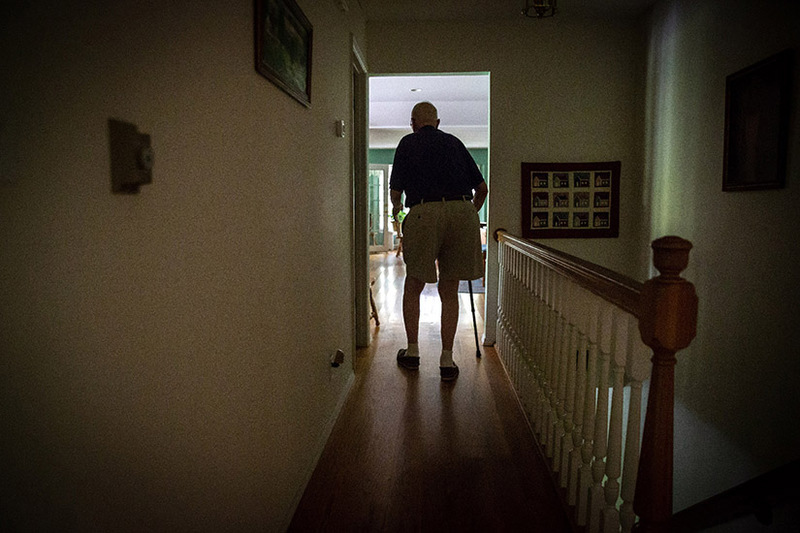 Harry Wappelhorst, a parishioner at Holy Rosary in Warrenton, is pictured walking in his home. parishes. The old school up-close-and-personal approach didn’t resonate with everyone, though. The punchline: “No one answered the door,” he said, with a hearty laugh. Still, Wappelhorst kept knocking on doors and listening to stories of St. Pius X parishioners. Wappelhorst was among the appeal’s earliest volunteers and, with the exception of stints living in the Chicago and Houston areas for work, he’s been a mainstay helping the archdiocese’s appeal ever since. He and his wife, Patricia, (who died in 2016) retired to Innsbrook in 1994, and with plenty of free time, Harry took the reins as appeal chairman at Holy Rosary Parish in Warrenton. He spent 20 years in the role and relished meeting fellow parishioners and sharing lively banter at the pledge-card table. “People here are very generous; it’s a very generous parish,” he said. 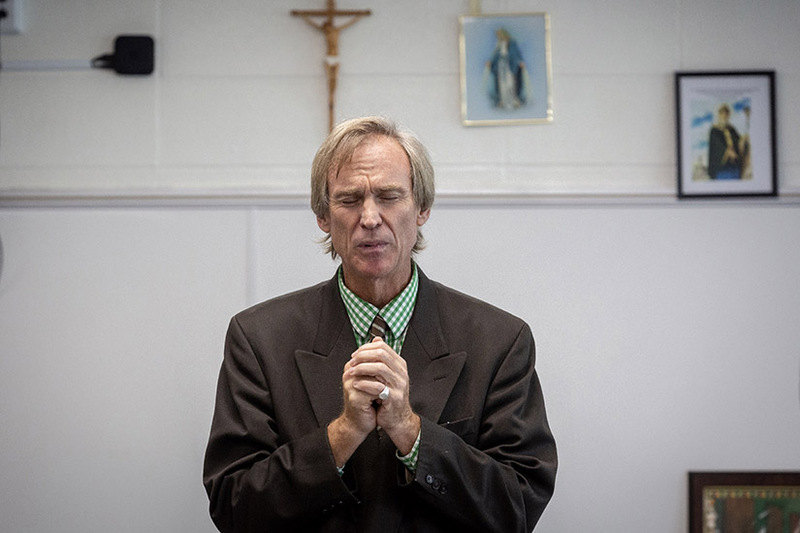 Bob Hennekes, a teacher at St. Dominic High School, started his introduction to engineering class with prayer on Sept. 4. Bob Hennekes experiences the impact of the Annual Catholic Appeal on a daily basis, and God-willing — as future clergy say — he’ll also experience it for the rest of his life. A teacher at St. Dominic High School, he’s in formation in the permanent diaconate, among 23 men in the class of 2022. Both St. Dominic and the diaconate are supported by the ACA, which in turn is supported by the St. Louis faithful. A native St. Louisan, Hennekes, 59, grew up in New Jersey and California, received a bachelor’s degree in chemical engineering from the University of California-Davis in 1981, worked in the oil industry and traveled the world. He returned to the St. Louis area to live with his elderly father five years ago, started teaching at St. Dominic and entered the diaconate in 2017. As a teacher, Hennekes teaches more than the subject at hand. “I don’t just teach math, engineering, physics and chemistry — I teach who Jesus Christ is; I happen to hit on the other subjects every once in a while,” he said. Hennekes wants students to thank their parents for their Catholic education, giving them a homework assignment to do just that. The ACA also minimizes costs for men in formation for the diaconate. Scott Nyuyen is in his fourth year of the College of Pharmacy at Washington University in St. Louis. He and other students were in fellowship before Mass celebrated by Father Gary Braun on Sept. 11 at the Catholic Student Center for the university. 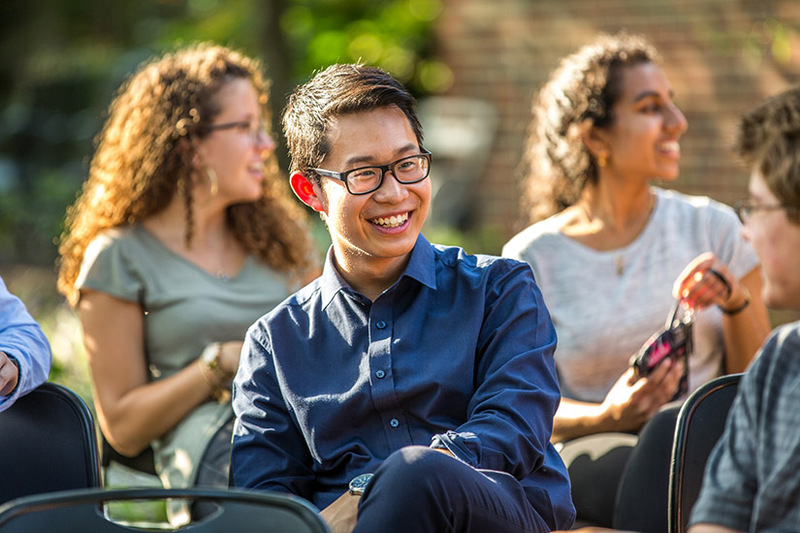 The Annual Catholic Appeal has been instrumental in the growth of the CSC, which seeks to form students intellectually, morally, socially and spiritually according to the wisdom of the Catholic Church. A recent study by St. Mary Press reports sobering data about young adults in the Catholic Church: They tend to leave the faith by the age of 13. However, in the Archdiocese of St. Louis, the Catholic Student Center at Washington University in St. Louis appears to be “bucking the trend of kids leaving the Church,” CSC director Father Gary Braun said. The CSC team — director of ministry Troy Woytek, campus ministers Sean O’Rourke, Kristy Chan, Jim Dryden and Bryan Beams and Father Braun, himself — literally meets students where they are, on the Hilltop campus. “We have to get out there more than ever because the attrition before college is so high,” Father Braun said. The same holds true for other college campuses in the St. Louis area at which Newman Centers are thriving. Lindenwood University’s Newman Center recently added its own chapel from humble beginnings in an old classroom. The University of Missouri-St. Louis’s Newman Center also has grown, among others. CSC has helped make this so, with support from the ACA since Father Braun’s arrival in 1991. Then, the Catholic Student Center used ACA contributions to fund Newman Centers at area colleges and community colleges, which now receive direct appeal support. The appeal also helped CSC take its fund-raising to the next level. “Over years, they gave us seed money to do development work,” Father Braun said, noting that it helped CSC grow in scope and reach since the early ’90s. “It all blossomed from the the path the ACA gave us to do development work.